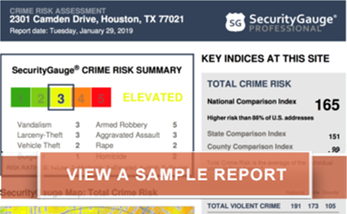 SecurityGauge® is an objective and quantitative assessment of crime and security risk at any U.S. address. 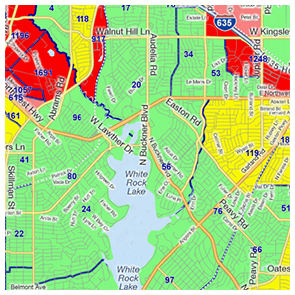 The competition's maps provide information by census tracts. SecurityGauge uses high resolution data to predict to 100 sq. 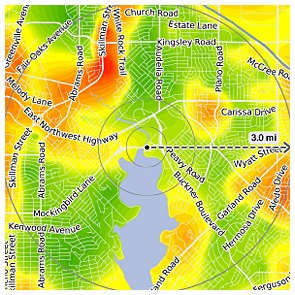 meter areas, which is 48,000 times smaller than the median census tract, and 1.2 Million times smaller than the average census tract in America. Based on 350,000 policy years of insurance data and actual theft claims with SecurityGauge Crime Risk Ratings assigned to each address. We binned the addresses for each homeowner insurance policy provided for this study into categories by SecurityGauge Total Crime Risk Score, getting the mean rate of theft claims per 1,000 policies for each category, and using that to determine our predictive accuracy against the insurer’s actual experienced rate of theft claims. The study included both urban and less urban (suburban, rural) areas, and encompassed multiple states. The test was double blind (SecurityGauge received addresses, appended Total Crime Risk ratings to each address, handed the file back to the insurer, and only then did the insurer identify which addresses had a crime-related insurance claim). 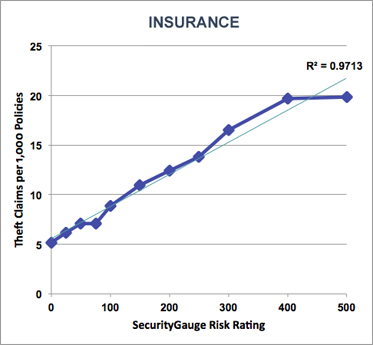 SecurityGauge then did the analysis, as did the insurer, both independently, and shared results which corresponded.